Well , I managed to sequence 3 songs on Oct 30th. 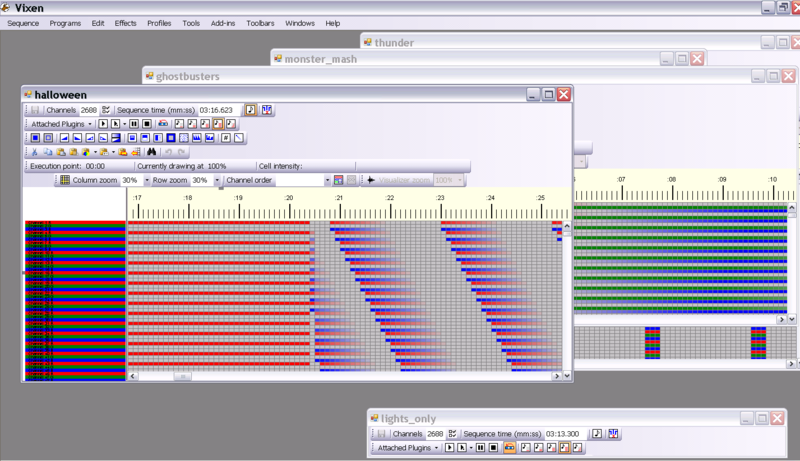 Next i created a single strand model using 7x128 pixel strings. In the end , i used Vixen because it loaded the files faster. I sequenced a 4th file, 30 seconds of thunder and rain. A made a 5th file , just lighting effects, no audio. Now , I am ready. Opened 5 files in Vixen. It is almost 6pm, Halloween night. We have had only one boy come to the house. It looks like this Halloween is going to be light on kids. My 11yo twin's want to get out and get candy. What to do? Ok, I quickly show my wife, here is Vixen, there is a play button here. Click on the window you want to play and click play. I leave with my boys planning to be gone 30 minutes. I am pretty sure i will come back with windows munged up or something. It turns out i am gone 2 hours. As i come back to our house. I notice something strange, the one color chases that i created are now two color?? I am thinking my wife was going to be having problems using Vixen. "I am running the lighting only sequence in a loop. I then run one of the three songs (1-3) above. As children turn into our driveway i then launch the 30 second thunder track. It takes 4 seconds before the Thunder and lights go off, so if I launch it as they turn into our driveway the children are directly under the web when the lightning fires." I was unaware that vixen/lynx would logically OR the three sequences together or that the audio would mix between the two concurrently running sequences. It worked perfectly. On demand thunder in the middle of a song. Her comment, "I though you said this was difficult?" We had larger and larger crowds. Last year we went through 1/2 bag of candy, this year 3 bags. My wife took one son around our neighborhood. She was behind a group of ten teenagers. One group met another , the first group said "Are you going over to the party house?". We had kids dancing to ghostbusters in the front yard. People taking pictures of the spider and web. Sequencing not perfect, but it worked. Nice work, simple and effective and its great your wife taught you something without even realizing. in denver, snow doesnt last. the last picture was taken two days after the first.